Prepare all vegetables for stew; set aside. Clean shrimp, rinse, and dry with paper towels to remove excess water. Rinse scallops and dry off excess water with paper towels. Cut tilapia into 1 inch pieces. Store seafood in refrigerator until ready to add to recipe. Heat 3 tablespoons of olive oil in a Dutch oven to medium heat. Add onions, carrots, celery, fennel, and bell pepper, cook for 6 to 8 minutes. Stir in garlic, bay leaves, oregano, and cook 1 more minute. Add tomato paste, lemon zest, juice, 1 teaspoon salt, and 1/2 teaspoon of pepper, cook for 2 minutes. Stir in fire roasted tomatoes and chicken broth, bring to a boil, and taste for salt. Reduce the heat to a low simmer. Cook stew for 7 to 9 minutes. After that time, add in the fish, shrimp, and scallops. Stir gently and cook for just another 2 minutes. Cover and remove from heat, let stew stand for 5 minutes. Serve right away or cool and reheat before serving. Ladle the soup into 6 large bowls and garnish with cabbage, radishes, cilantro, and lemon wedges. If using frozen seafood for this recipe, please defrost the seafood in the refrigerator for 2 days before preparing recipe. If you cut up the seafood into smaller pieces, you could serve up to 10 servings as a starter. The stew base can be made a day or two ahead. When ready to finish preparing, bring up to a boil and add the seafood as directed in the recipe. You don’t have to travel to a warm tropical island to enjoy a tasty bowl of seafood. 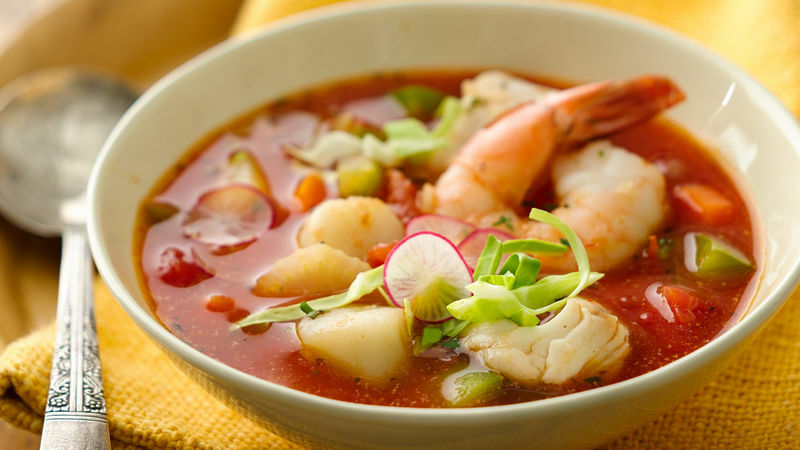 This tilapia stew with a rich tomato base, crisp vegetables, scallops, and jumbo shrimp, will leave you wanting a second bowl. This is a quick and easy recipe for any week night or that special dinner with friends. Just a few short years ago, my husband would not eat seafood until I prepared him a perfectly seasoned shrimp recipe! He has been hooked since then.